RESPONSIBLE PARTY: Monsanto Company, a nefarious racket with a rap sheet as long as your arm. The abuses of this party are well known and documented but we have yet to procure a confession or any acknowledgement of wrongdoing. However recent intelligence indicates that things are heating up for Monsanto and could indeed culminate in an indictment and guilty verdict. ALERT: If this crook has been in the vicinity of your yard or garden you may need to take action to remediate damage caused by stolen minerals. Start making compost, stop using synthetic fertilizers, apply mulch and good quality natural soil amendments for the earth. If found in food supply you may need mineral supplementation; also, stop eating GMOs and start eating the good stuff. If you think the locks on your doors keep you safe from this scoundrel, think again. The Roundup® formula has ways of breaching biological barriers. While the active agent involved is the chemical glyphosate, the Roundup® formula has a known associate that helps the perpetrator gain access. This accomplice may at first glance appear no more dangerous than dish detergent, and has been reported as being “inactive” but is anything but. Don’t be fooled by this slippery character whose record is not so squeaky-clean beneath the surface. Speaking of surface, this agent operates as a surfactant which makes cell walls permeable so that the glyphosate can trespass and do the dirty deeds. This nefarious duo can do way more damage together than the primary suspect alone is capable of. ALERT: It is best to avoid contact. Don’t allow these perps anywhere near you or next of kin. We’re putting out an APB on this suspect. Exposure to endocrine disrupting chemicals during fetal development and/or puberty can lead to reproductive diseases, endocrine related cancers, behavioral and learning problems including ADHD, infections, asthma, obesity and diabetes. ALERT: BE AWARE! There are no safe levels of endocrine disrupting chemicals! This suspect must be kept away from your family’s dinner table. Yes, that’s right–this suspect kills life almost indiscriminately. Glyphosate was patented as a pharmaceutical anti-microbial and kills beneficial microbes leaving the pathogenic troublemakers behind to wreak more havoc both in the soil and guts of living beings. Long term low dose consumption of antibiotic drugs leads to antibiotic resistant diseases for which we have no treatment. In a world where we require that pharmaceutical drugs be administered by someone with a medical license, it is truly a crime that this biocidal maniac has been insinuated into the food supply; that a pharmaceutical antibiotic is being administered to the general public without informed consent. This is a direct violation of the Nuremberg Code. Suspect must be apprehended! ALERT: If you have been host to this suspect you will need to research ways to restore your healthy gut flora, just like after taking a course of antibiotics. You can start by eating healthy fermented foods. If you are concerned about damages incurred by the perpetrator, you may opt for biological testing available here. Special message from the CRIME LAB: Suspect has been shown in laboratory study to kill human placental cells at levels lower than is allowable in drinking water. ALERT: Need we say more? If you are pregnant or thinking about becoming pregnant avoid this dangerous human placental cell killer. The World Health Organization has classified glyphosate as a probable human carcinogen. And, this just in . . . another special message from our CRIME LAB: Suspect has been shown in laboratory study to induce the growth of estrogen receptive breast cancer cells in the parts per trillion range. It’s not looking good folks, since this criminal lurks in the food supply in the parts per million range. ALERT: If you find yourself in the suspect’s presence, run as fast as you can in the opposite direction! Just kidding, you will be fine if you just avoid suspect by eating mostly organic and Non-GMO Project Verified foods. . . oh yeah, and let your legislators know that they need to support mandatory labeling if they want your vote so that people who can’t afford organic food can at least have informed choice. This perpetrator is not content to steal, trespass, cause general upheaval and kill. No, the suspect will not be satisfied until the damage spreads to destroy the soil, foul the water, mutate the amphibians, decimate the bees and starve the Monarch Butterfly. ALERT: Don’t aide and abet by releasing this toxic operator anywhere! SUSPECT’S WHEREABOUTS: In GMO foods, in non-GMO foods that were subjected to a pre-harvest application of Roundup®, in our soil, ground water, rain water, mist, urine, breast milk, baby food, baby formula, school cafeterias, prisons, vending machines, hospital feeding tubes, convenience stores, bodegas and many other places. You should be able to avoid encounters with suspect if you are able to shop and garden organically with these alternatives to ROUNDUP®. 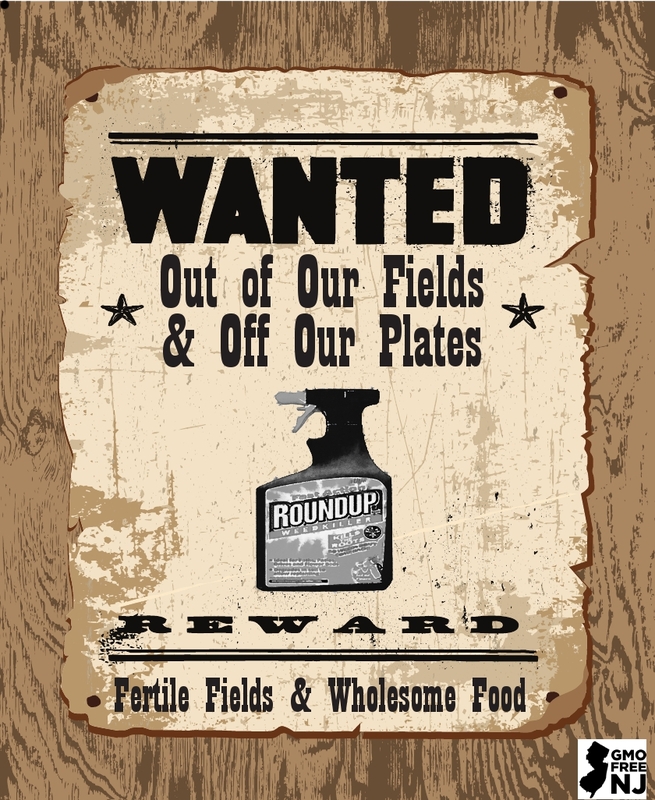 SPECIAL ALERT: We strongly encourage all citizens to carry out their civic duty to cuff and collar the destructive Public Enemy #1, ROUNDUP®! Please exercise your common law right to make a citizen’s arrest; no warrant is needed and you will help to bring peace to the commonwealth and health & wealth to the Commons. This entry was posted in Articles and tagged GMOFreeNJ, GMOs, RoundUp, RoundupTheUsualSuspects, StopMonsanto. Bookmark the permalink.